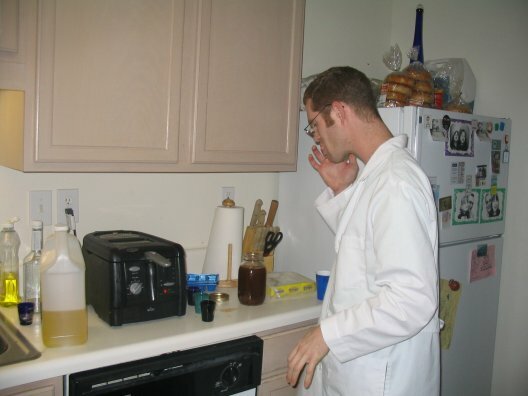 Though the Mad Scienticians had never attempted to create infused vodka before starting this blog, we have a long history of theoretical and practical experimentation in the field of Alconomics, the scientific study of intoxicating beverages. In the theoretical realm, we developed the Drunken Equation, a mathematical representation of an enjoyable drinking experience. Our practical work has been even more extensive over the years. 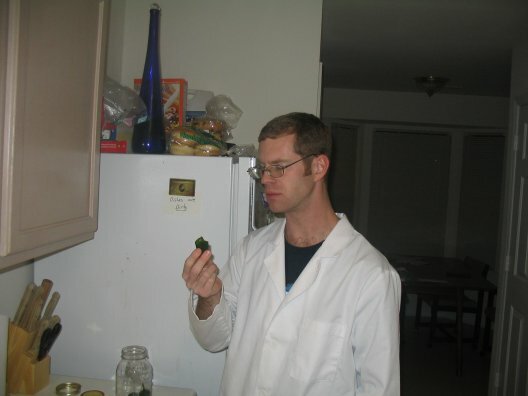 Today we've decided to show our readers a glimpse from our early days of Alconomics: specifically, our very first experiment with Chemical X, on December 30, 2001. 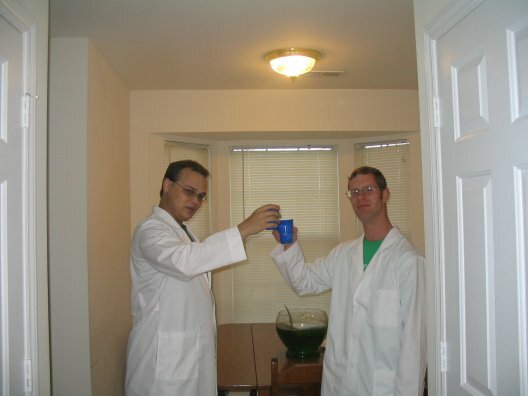 Here, you see the Mad Scienticians as they were in the days of old. 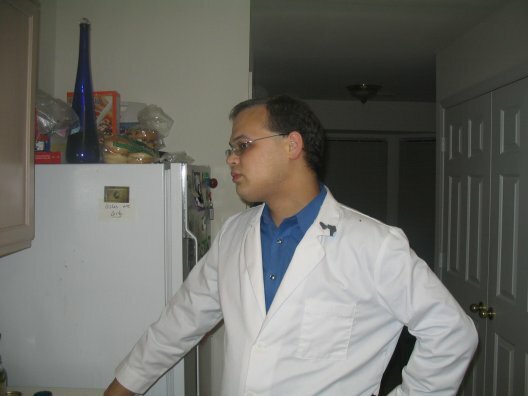 As you can see, the laboratory we used in those days was highly unkempt (as were we), but we managed to accomplish our work nevertheless. 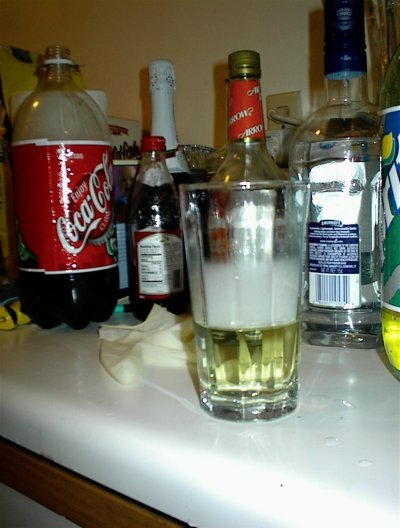 We acquired a sample of Chemical X this day without any specific plan in mind, we just wanted to see our drinks smoke and bubble. I haven't a clue exactly what type of beverage we are holding here. 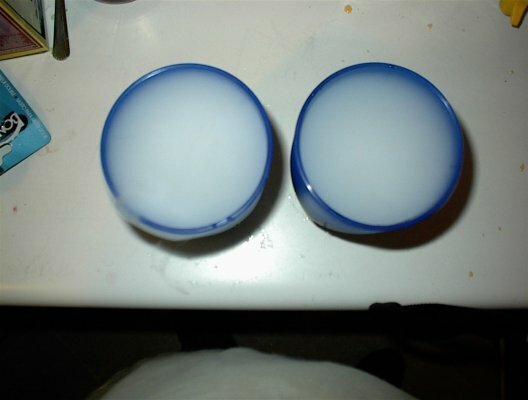 A close-up of the beverages reveals the effects of the Chemical X more clearly. 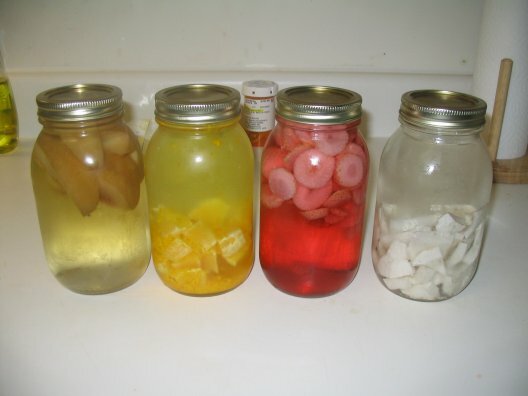 These drinks, if I am not mistaken, are likely to be kamikazes. 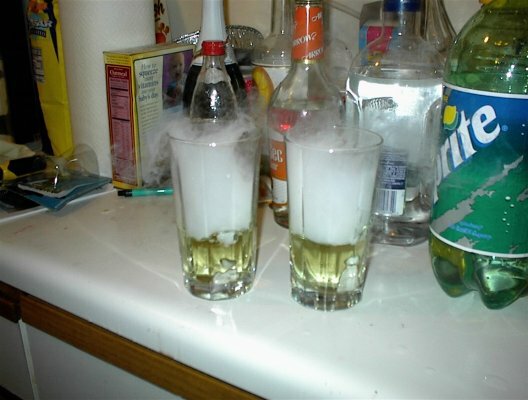 The clear glasses are much more appropriate for the use of Chemical X.
I include this overhead shot only to point out the cocktail recipe to its right. This cocktail, the Amethyst, was a favorite of Wayland's ex-wife, and was once thought long lost after slipping into who knows what drawer, crevice or temporal vortex in that mess of a laboratory. 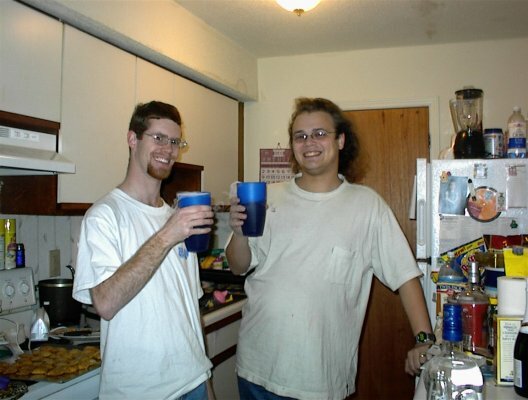 Several years later, we found this photograph, the only known record of the drink. 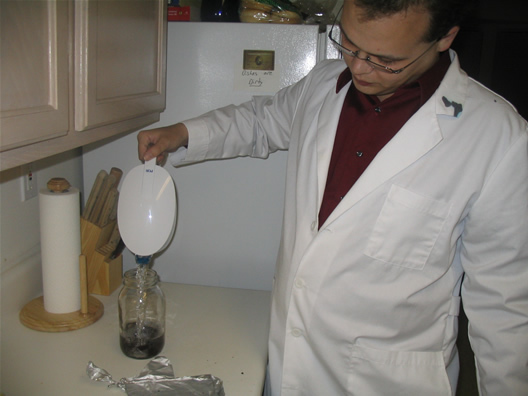 Lastly, we decided to attempt to re-carbonate a bottle of flat Coke using Chemical X. As the substance evaporated and bubbled through the coke, we realized that most of the carbon dioxide was escaping, making the exercise futile. 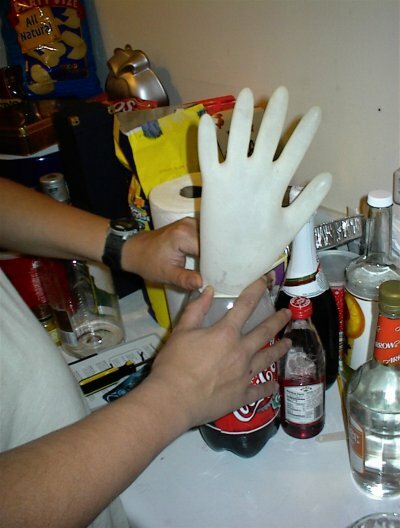 After playing a bit with CO2-filled rubber gloves, we capped the bottle to retain the gas. 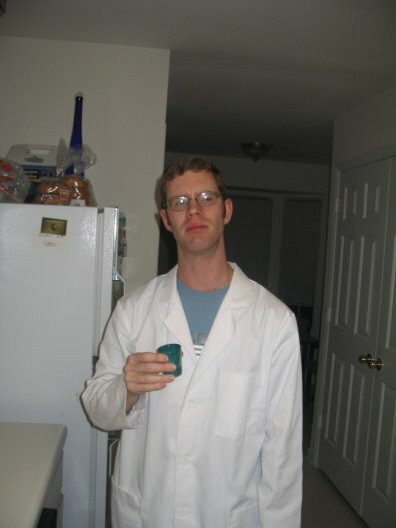 If I remember correctly, the pressure expanded and distorted the bottle, but the Coke still tasted flat. It was worth a try. 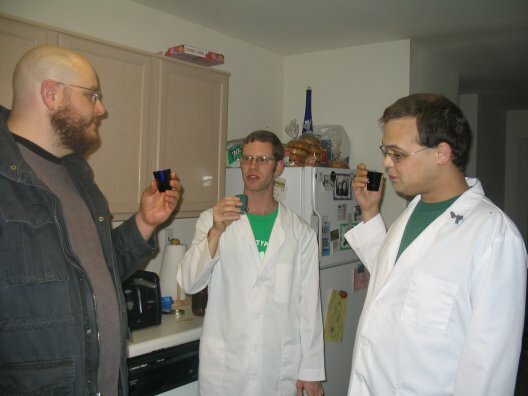 After a week of infusion, the Mad Scienticians sampled the ongoing grape vodka experiment to see what progress it had made. There was no change in color, other than a slight cloudiness (not quite as extreme as it appears in the photo), though we hadn't expected much coloration from the white grapes. I was the first to try it. It's a shame the camera clicked when it did, because a split second later, I was gasping. It's not that it tasted bad, it's that there was no flavor at all. "That's all vodka," I said. 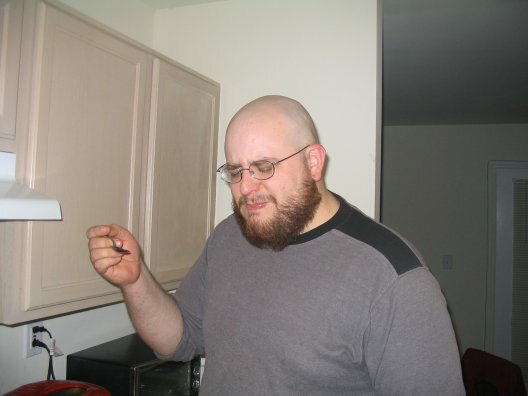 "I can almost taste a hint of grape in there, but it's so faint it's nearly unnoticable." Wayland was equally unimpressed. "That burns like unfiltered," he declared. "There is a wisp of grape on the front end, though." This infusion obviously needs to sit longer. We added a spoonful of sugar, hoping it will help set the infusion in; this method seemed to work well in our coconut vodka experiment. If that doesn't help, we may have to try again using sliced grapes, instead of simply piercing them. We'll sample it again next week and keep you posted. 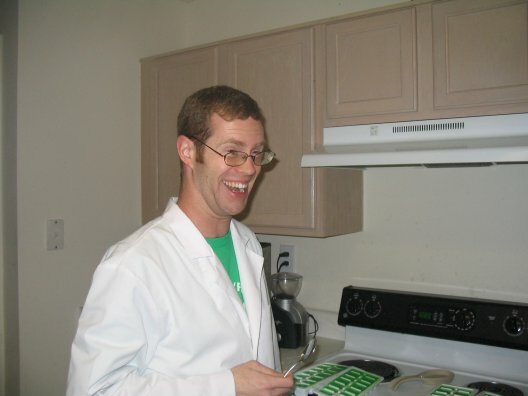 In the meantime, check back tomorrow for a very special retrospective on the Mad Scienticians! This week we are making garlic vodka! This has been done at least once before, by the Vodka God, though we are going about it in a different way. Arthur's garlic vodka, being a last minute decision, was created using minced garlic and Cîroc vodka, whereas we are infusing halved cloves of fresh garlic in our usual quintuple-distilled baseline vodka. 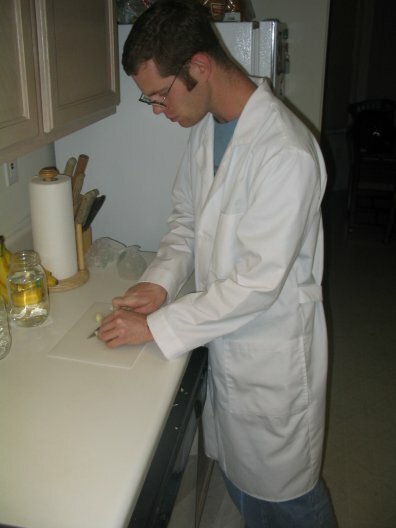 Brendan cuts three cloves of garlic in half. 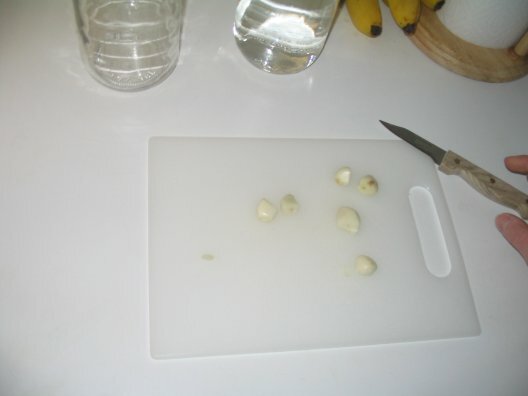 We considered slicing them further, but did not want to make the garlic flavor overwhelming; if it doesn't turn out strong enough, we may try it again with sliced garlic. We'll give this a try in a few days. Tomorrow, check in for the first results of our Grape vodka! Two of our most long-awaited vodka infusion experiments are finally complete! Our coconut vodka took over a month to infuse; the chocolate took less than a week once started, but we spent at least as long as the coconut just deliberating over how we ought to do it. Nevertheless, both infusions were quite successful. We debuted the chocolate vodka for its first tasting on Saturday night, at our Saint Patrick's Day party. 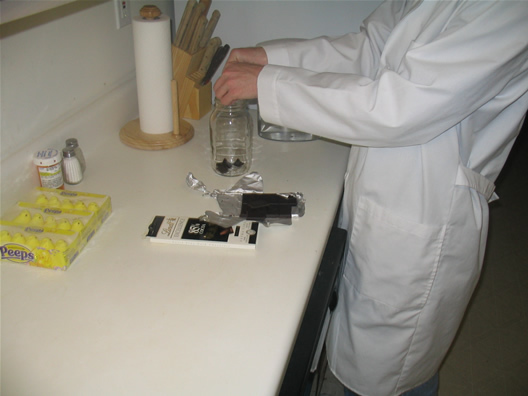 The pieces of chocolate had not fully dissolved, but their appearance had changed little over the last couple of days; we believe that the vodka had reached a critical point of saturation, and that the chocolate was unlikely to dissolve entirely. The edges and vertices of the pieces had separated, and though the Lindt logos had dissolved away, a few pieces still had lines on them from the design imprinting. As I lined up three sample shots, I licked some chocolate vodka from my fingers. Yummy! The Mad Scienticians and visitor Matt tasted the vodka, and all approved, though the bitterness of the 85% cocoa hits pretty hard. It's tasty, but I believe it should be mixed with something sweet. "Pretty decent," Wayland said. "It's got a strong chocolate taste, but it fades quickly, leaving vodka." Since we were already slightly drunk from the green punch when we took this sample, we tasted it again on Tuesday. We happily confirmed the conclusions we reached on Saturday. 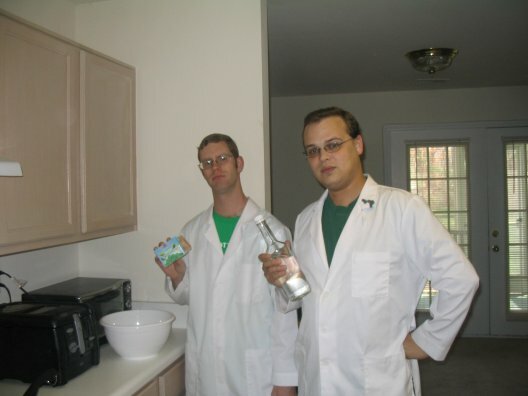 We then bottled the vodka and I tasted a piece of the chocolate. It tasted much like it did before it soaked in vodka for a week; tasty, but slightly bitter and not very sweet. There was little absorption; only the slick taste of vodka on the surface. Much like our caramel vodka, the chocolate vodka is a suspension, not a true infusion. Given time, a small layer of chocolate sediment settles to the bottom of the bottle, though the effect is not as extreme as with the caramel. The vodka will have to be shaken before each use. Tuesday night also saw the end of the coconut vodka infusion, which ran for a record-shattering 35 days. Last week, when we sampled it for the second time, we considered bottling it then; though the taste was still primarily vodka, the coconut had finally made a significant appearance. We ultimately decided to give it just a little longer, and now we're glad we did. The vodka kick is still there, but it's diminished a great deal since last week. 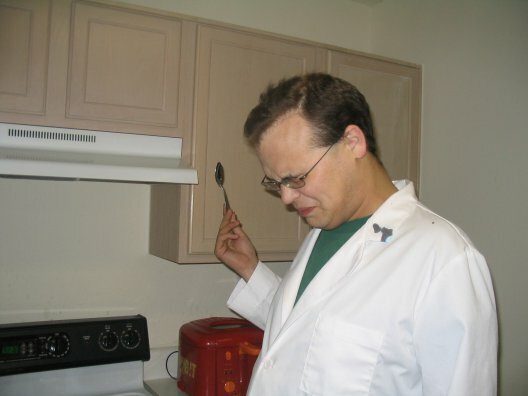 I had thought about adding a second spoonful of sugar after the last tasting, but it turns out we didn't need it; the first spoonful set the coconut in further with time. 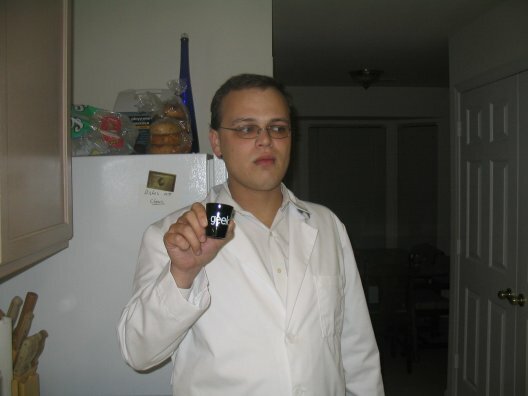 Yes, Wayland, for the thirtieth freaking time, we see your shot glass. It's clever. "The vodka's pretty smooth," Wayland said. "It's neutral when you drink it, but leaves the taste of coconut behind." As one might expect, the coconut didn't add much color to the vodka, other than a slightly foggy appearance. 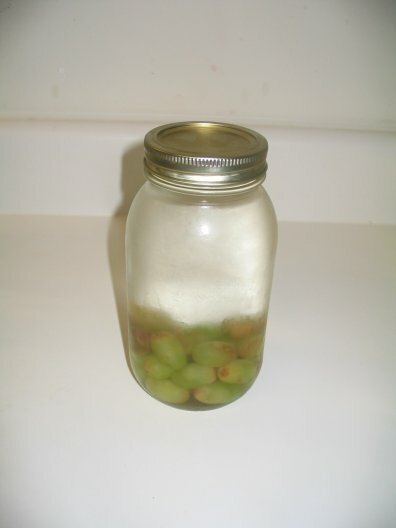 Our vodka infusion experiment for this week is grape vodka. Tomorrow, we will post the results of both the chocolate and coconut vodkae. 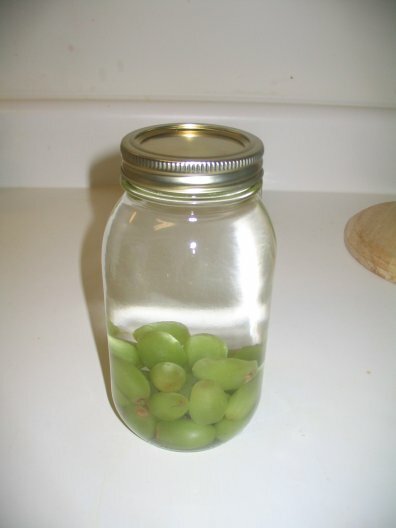 We used about 25 seedless white grapes for this infusion. 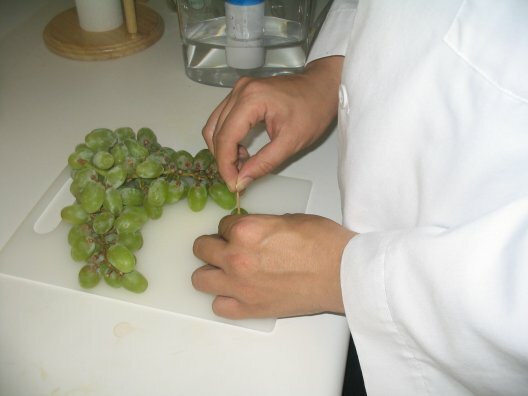 We pierced each grape through twice with a toothpick, to release the flavor slowly. In retrospect, it would probably end up looking a lot cooler if we had used red grapes, but this should come out pretty tasty. We'll check on it in a week and see if it needs more time. Warning: extremely drunk content ahead! Ah, Saint Patrick's Day. 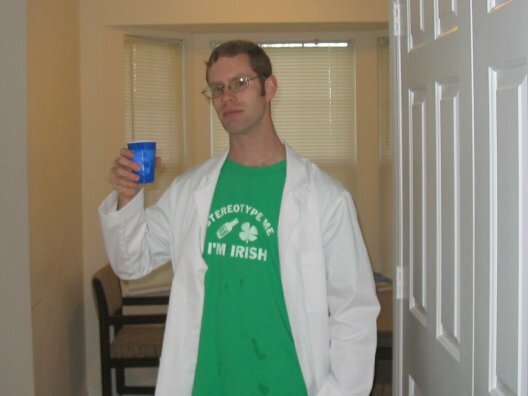 The day on which a young man's fancy turns to intoxicating beverages and the color green. We at the Infusions of Grandeur laboratory can't let a holiday like this pass without a very special celebration. We decided to mark the occasion with a pair of excursions into the field of Alconomics. 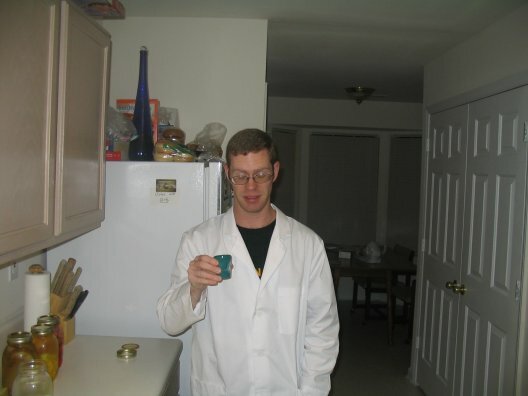 Firstly, we peer-reviewed the formula for the ultimate Jell-O shot developed by the fine scienticians at My Science Project. Secondly, we created a modified version of The Vodka God's famous punch for the second time, though this time, we added a new twist. That's right. In the spirit of the holiday, this punch is green (sir). But we will get to that in due time. Let's talk Jell-O. 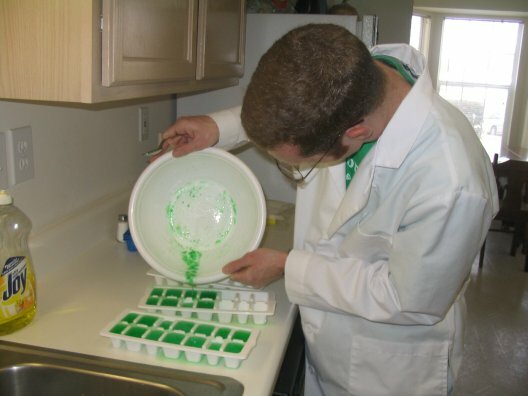 The folks at My Science Project determined that Jell-O can hold up to 19 oz. of vodka per batch before losing cohesion, and a little more using sugar-free Jell-O. We decided not to quite toe the line; we used the sugar-free stuff, but kept their original ratio. Of course we used lime. Alas, in our carelessness, we made one fatal flaw as we made the first batch. We didn't fully dissolve the gelatin in the hot water before adding the vodka, so some of it remained in powdered form at the bottom. * And this is where science broke down. After measuring 19 ounces of vodka, only a small amount remained in the bottle. Since sugar-free gelatin can handle a little extra, we decided to toss in the remainder, which is why we don't have an exact measurement listed above. 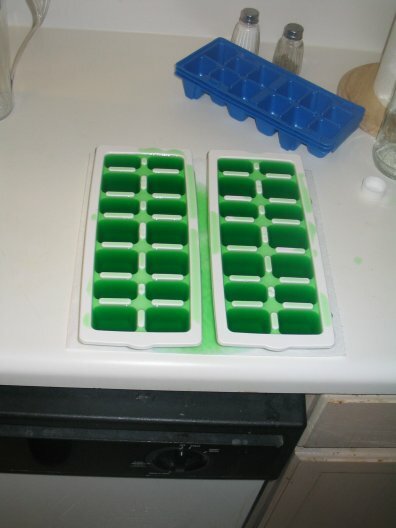 With all ingredients mixed, I poured the gelatin into one and a half ice trays to create single-serving Jell-O shots. 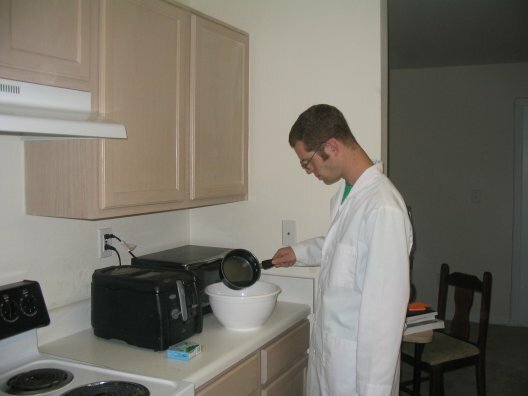 We decided to do a little calculation before starting the second batch. We determined that by using a full bottle of vodka, we could preserve the original (intended) ratio by increasing the hot water to 4 oz, and adding another packet of gelatin as a cohesion safety margin. A bottle of vodka, at 750 mL, is equivalent to 25.36 ounces; this ratio yields a Jell-O shot that is about 34.5% alcohol, or 69 Proof. Bill and Ted would be proud. Beautiful! This formula yielded enough to fill two ice trays perfectly, minus an immaterial amount of spillage. We put both batches into the freezer -- we like 'em with a little ice crystallization -- and moved ahead to the next project. 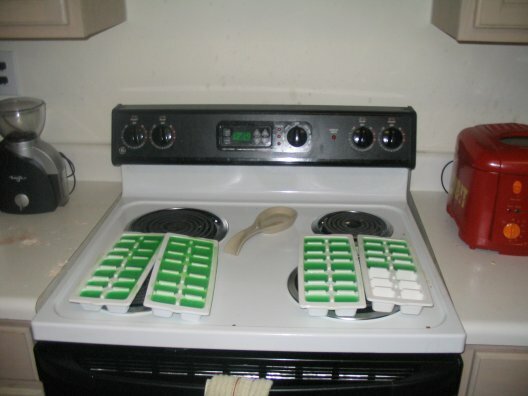 We'll return to the gelatin later. This batch of punch was similar to the punch we made for our New Year's Party, but we altered the recipe further, both for taste and for color; we also neglected to add any Chemical X. It is still based on the original formula developed by Arthur, the Vodka God, but again, that formula is protected by a strict non-disclosure agreement. 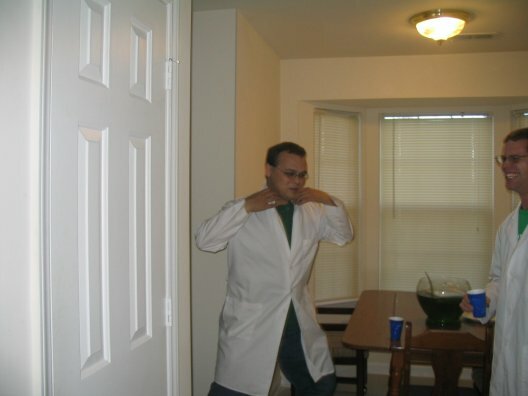 Within seconds of his first taste, Wayland noticed that his collar was flipped up, and previewed the events to come with an impromptu Doctor Elvis routine. As out guests arrived, we settled in to watch the classic Peter Jackson film Meet the Feebles. Anyone who has seen this movie can imagine how much punch we downed to make it through. We followed this by playing Abe Lincoln Must Die, the latest in the episodic Sam and Max adventure game series. By this point we were all quite drunk, not to mention hopped up on sugar and caffeine. A perfect time to break out the Jell-O shots! Should we really be eating these? Absolutely not. These Jell-O shots are practically straight vodka, and as you can see, we're pretty drunk already. I'm not entirely sure what this was about. 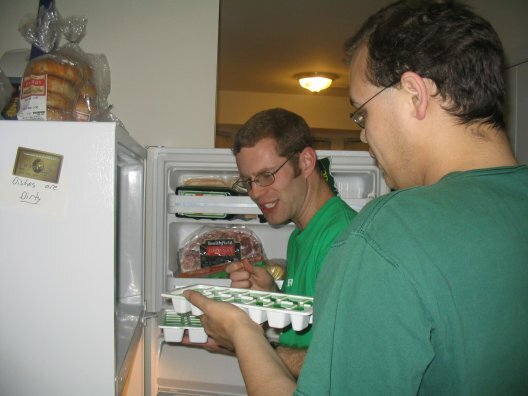 I think I was trying to explain which batch of Jell-O shots was positioned lengthwise in the freezer and which were positioned widthwise. But the important thing is, both batches congealed properly, despite the problems with the first batch. But how did they taste? I could not rein in my enthusiasm. I tried a shot out of the first batch. Man, that sucker was strong! I didn't care. I recall it being pretty tasty, despite the strength, but my judgement at this point should not be relied on, folks. 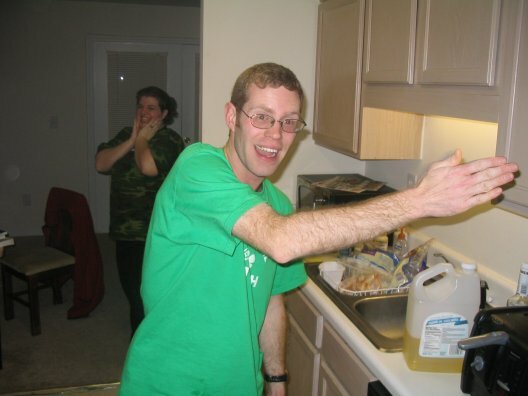 Wayland's drunkenness was not sufficient to cover the vodka kick, nor was Matt's. The second batch tasted much better. Since they both have approximately the same vodka/alcohol content, the additional gelatin (and lime flavoring) in the second batch seems to have been the deciding factor. Our memories are a little fuzzy from there. So, we confirmed the valuable lesson of Khitomer: just because you can do a thing, does not mean that you must do that thing. 69 Proof Jell-O sounds great in theory, but it's not the best idea in practice, especially after guzzling Arthur's punch all night. Monday night, on the one month anniversary (!) of the coconut vodka experiment, we sampled the vodka yet again. We also completed three other infusions of previous flavors (apple, orange, and strawberry), to replenish our supply. We were nearly ready to give up on the coconut infusion; when we first tasted it two weeks ago, there was hardly any coconut taste, and we did not expect it to be much better this time. We were pleasantly surprised. "It smells more like coconut now," Wayland said. 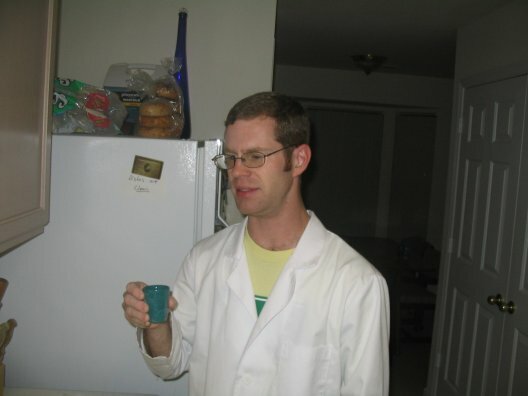 "It still has a strong vodka flavor, but it does taste like coconut." I tasted it next, without fully preparing myself for how vodka-y it still is. The vodka still kicks at full strength. The coconut vodka is still not as strong as I would like, but it's definitely stronger than it was two weeks ago. It seems that the sugar we added after the first sampling had a significant effect. I am hoping that another week will make it more strongly flavored, though Wayland believes it has reached its limit. We're giving it until next week, just to be safe, but after that we're calling it done whether it's changed or not. The best thing about making a new flavor of vodka each week is that we always have a well-stocked bar. Though we don't drink it nearly as fast as we make it, we have gone through a good few bottles of vodka since launching in December. We've been restocking most of our infusions as we run out, but haven't mentioned this much in the blog (with the exception of the horrendous Strawberry Mark II). We've decided to start logging these remakes here, though none will get full write-ups unless we make major changes to the process. Batch three of the strawberry vodka is a return to form. We created it the same way we made the highly successful first batch, except that we let this one run longer: nine days, instead of the original four. (This should not in any way indicate that we forgot about it. No sirree.) As a result, this batch is tarter and more pronounced in flavor than the first batch. We think it will be even better in drinks because of the stronger flavor. The apple vodka, though we have not quite finished off the first batch, is one we have been wanting to repeat for quite some time. 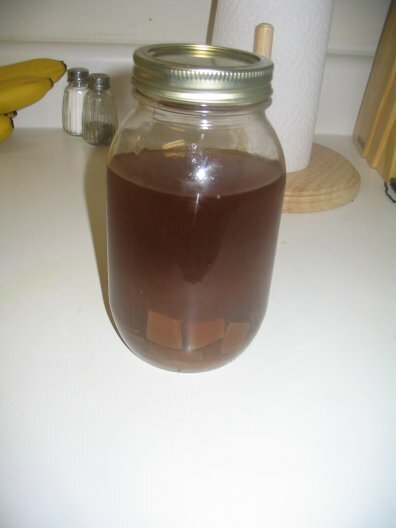 The first batch has been met with a mixed reception; Wayland enjoys it, as did The Ferrett and his entourage, though I have never liked it -- to me, it tastes like apples that have been sliced and then left out too long. 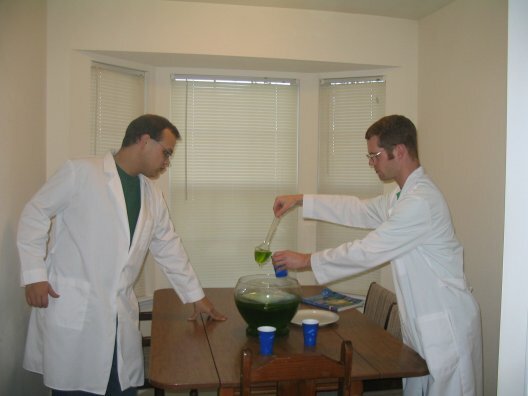 I have long felt that the problem was flawed methodology; being one of our first infusions, we did it in a non-airtight jar, and without refrigeration. With these potential flaws corrected, we decided to make a second attempt. We also neglected to use sugar in this infusion, unlike the first. 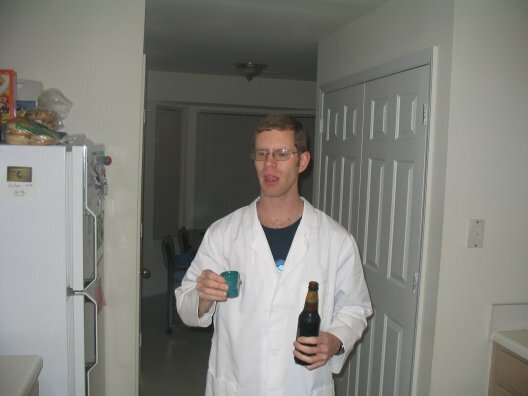 Wayland said that this batch has a stronger vodka taste than the original. He believes that the lack of sugar made a difference for the negative. I decided that this batch is better than the first; it doesn't have the "off" taste, though it does have a slight bitterness that could have grown into that effect. I agree that sugar would have probably improved this infusion. That said, the bitterness will probably be diluted in a mixed drink, and I look forward to trying it. Finally, we bottled and sampled our second batch of orange vodka. We altered our original procedure by zesting the orange with a cheese grater, as we learned to do during our lime vodka experiment. The zesting process doesn't seem to have had much of an effect on the flavor; it's very good, but basically the same as the first batch. Of course, we could only confirm this if some of the original batch was left to do a side-by-side taste test. We may arrange such a test in the future, to determine whether to continue zesting our citrus infusions or not. Chocolate vodka is something we've been wanting to create for a long time, but haven't quite been sure how to do it. 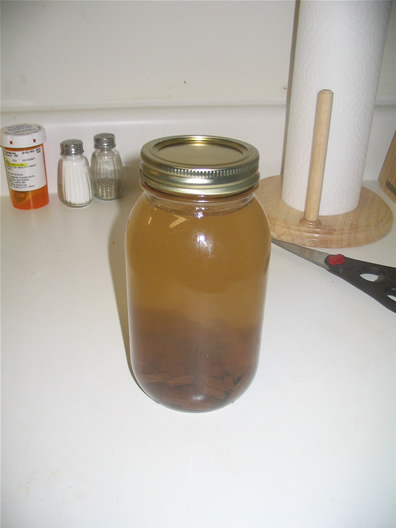 For a long time, we intended to infuse cocoa beans in vodka, but they proved fiendishly difficult to find, and several of our readers have suggested that cocoa bean infused vodka wouldn't taste very good anyway, since the beans are bitter without sugar and vanilla additives. We also considered creating a solution, rather than an infusion, much like our caramel vodka, but never followed through with it. 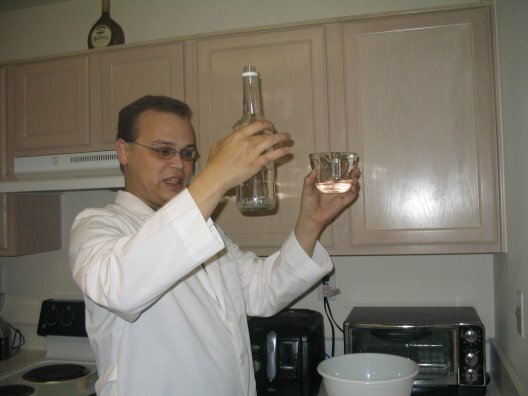 Recently, however, our friend The Vodka God created his own chocolate vodka (see his initial post and the results). 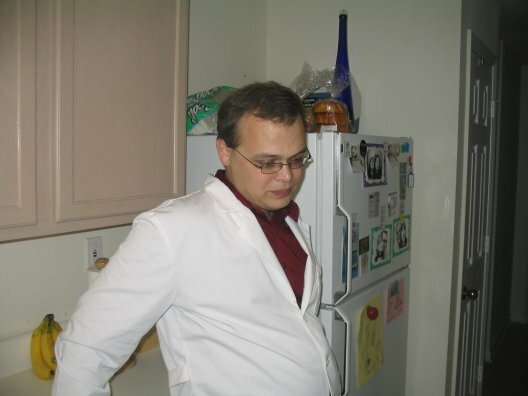 He created the chocolate solution by dissolving a confection known as Ice Cubes, which are apparently designed to melt under anything warmer than a sharp glance, into vodka. 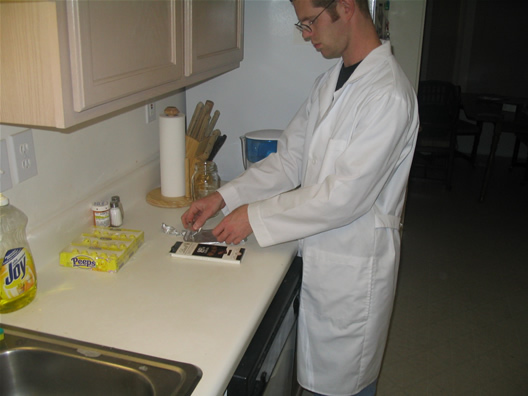 He likes the way it turned out, but we Mad Scienticians continue to wonder, could this work with a more "genuine" chocolate? We decided to give it a try. 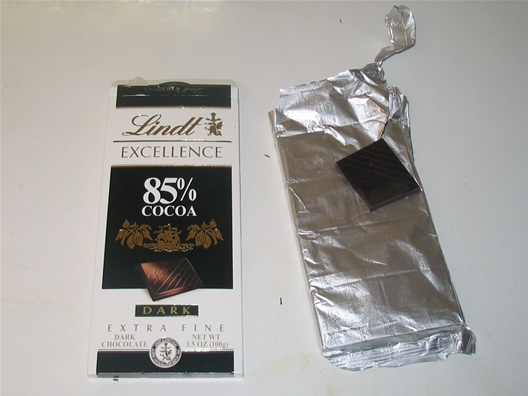 We acquired a Lindt chocolate bar with an 85% cocoa content; we hope that the remaining 15% will contain just enough sugar, vanilla, and whatnot to prevent an overly bitter vodka, while giving it the richness of fine chocolate. If the vodka is too bitter on completion, we can always add some additional sugar. The real question, however, is whether the chocolate will dissolve at all; it is much richer and heavier than Ice Cubes or caramels. We sampled the chocolate bar in its natural form first. It is much less sweet than we are used to from chocolate; Wayland did not enjoy it at all, while I noticed a gradual build-up of sweetness with each bite. We broke the chocolate into small pieces, dividing each square into fourths. The more surface area is exposed, the faster it should dissolve. It appears that the chocolate is dissolving, albeit slowly. This will certainly take longer than the caramel vodka or The Vodka God's experiment, but we hope to have a viable chocolate vodka by the weekend. 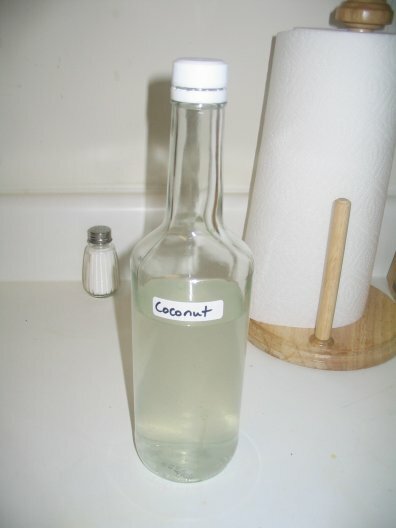 Tomorrow, we will be posting yet another status update on our coconut vodka experiment, and several repeat infusions. We've got three new cocktails for you, based on our previous vodka infusions. Unfortunately, none of them are among our best (in fact, all three got record-breaking low ratings), but some are at least good for a laugh, we hope. 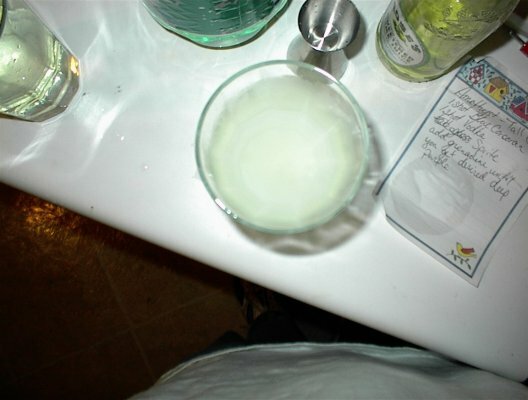 The first was created when we realized we still hadn't tested the recent lime vodka in a drink yet. 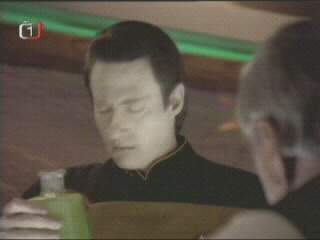 Alas, even at half-strength, the lime vodka is still quite sour. It may work better if reduced to one ounce; we may try that in the future. Wayland did a serious wince-take when he tasted this drink; it seems he has a low sour tolerance, dashing any hopes I might have had to create Warheads-infused vodka. I don't know how the hell Wayland did it with these ingredients, but this tastes just like cherry cough syrup. The ratio of the drinks we made may be slightly different from the above; we made doubles, using a full 8.3 ounce can of Red Bull each. This drink, of course, was created as somewhat of a joke; we set out to create the most artificially-flavored cocktail in existence. I found the result to be an astonishingly anti-harmonious drink. Both flavors of the Red Bull and Pop Rocks were distinctive, but somehow they coexisted without interacting at all. Each sip's flavor seemed to alternate between one and the other. "It started off well; it was a nice blend. However, when I got further into the drink, it actually decreased in quality. Unfortunately, my methodology was flawed. Rather than adding the vodka first and allowing the force of the Red Bull to mix it, I attempted to fill the glass as full as possible, by adding the vodka after the Red Bull. 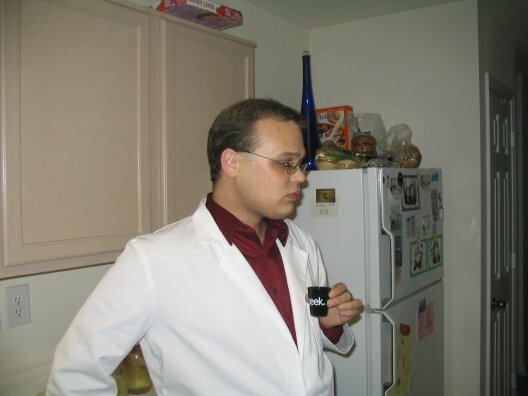 I think a quality blend can be made; however, the right ratio needs to be found out and the drink mixed fully before testing the quality of the drink." We sampled our jalapeño vodka experiment last night, while preparing to watch Duke and North Carolina State square off in the ACC tournament. (Way to go, Wolfpack! Sorry, Wayland.) The peppers had infused in the vodka for three days. We decided to play it safe with this one, and have chasers at the ready, since we didn't know just how hot this was going to be. Wayland poured himself a glass of Irish cream, while I opted for a cold beer. I prepared myself for the worst, and knocked it back. Oh man, that is surprisingly good stuff. It takes a few seconds to kick in; initially, it tastes more like a bell pepper, with only a mild vodka kick. The heat is all on the back end, and in just the right amount. Wayland pondered for a moment as the two phases of the shot worked their way across his tongue and into his brain. "It's fairly smooth," he said. "There's a nice spicy bite that crept up on you at the end. The spice was at a good place, definitely spicy, but not overwhelming." After bottling the vodka, straining it through cheesecloth to remove the seeds, I fished half of a jalapeño pepper from the jar to try a bite. The pepper hasn't noticeably lost any flavor or heat in the infusion process. It just tastes like a regular jalapeño, slick on the surface with vodka, as if it had only been dipped in the liquor. 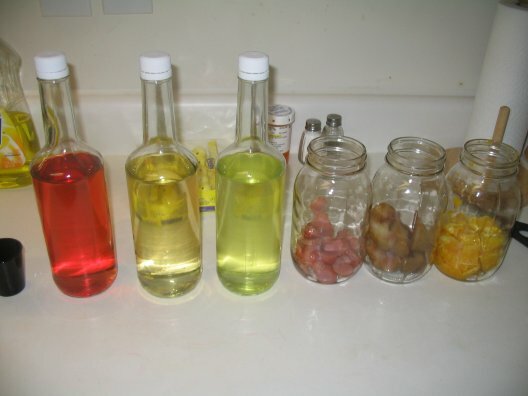 Next, I made a drink using the infusion, though Wayland opted to make a different drink to have with the game. This is a modification on the Caesar recipe found on the Inferno Vodka website, pointed out to us by a faithful reader (thanks, Lilcrow). I upped the ratio a bit, and didn't bother salting the rim. I have never had Clamato juice before, so I tried a little bit on its own before making the drink. To me, it doesn't taste much different than regular tomato juice. Wayland made all sorts of faces when I told him what Clamato juice is; but since he won't touch tomatoes or clams in any form, I let him know that he was in no position to judge. The drink was very tasty, though I didn't see much difference between this and a Bloody Mary. But then again, I've always preferred Bloody Marys (Maries? How do you pluralize that?) to be spicy. We've got a few other cocktails up our sleeve, involving previous infusions. We'll be posting those later this afternoon.